In the great dailysportscar disaster in February, we lost most of our 2002 coverage, but some of it survives….. This article originally featured in our ‘One To Watch’ column, and we’re delighted to reflect that someone, somewhere was indeed watching Rob Barff. After a fine drive in the factory TVR T400R at the gruelling 12 Hours of Sebring, netting an unexpectedly competitive finish, Rob is now joining a two car TVR effort at Le Mans. dailysportscar will feature Rob’s exclusive insiders look into Le Mans week, from the early ‘ceremonials’ through practice and qualifying and into the great race itself. Read about him and the TVRs here, throughout the week. A controversial point of view, particularly when you consider that the person delivering it was none other than his father Andy! While the line was delivered with heavily ironic tone, there is a serious point underlining the ‘joke’. Motorsport is very, very expensive and the patronage of wealthy parents has been the master key to many a talented young driver’s passage to the top of the sport. In that regard Rob hasn’t been as lucky as some other hopefuls, but the constant support and encouragement of his family has enabled him to continue to climb the motorsport ladder, while others have fallen by the wayside. It has been though, and still remains, a real challenge not only for his abilities as a driver but also as a businessman. “When people hear the phrase ‘TVR Factory Driver’ they immediately assume you must be either privately wealthy or paid an absolute bundle.” So says the newest addition (in April ’02) to the TVR factory family. 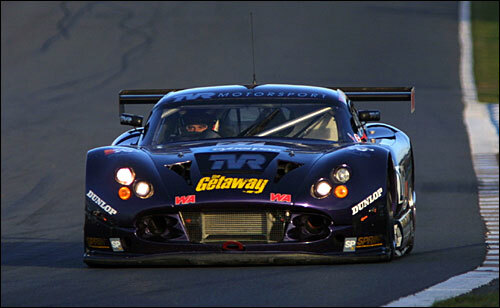 Rob’s 2002 performances, in what was universally regarded as a stupendously rapid but difficult to master TVR Cerbera Speed 12, proved that he has the talent to justify the title ‘Professional Racing Driver’, but the harsh realities of modern life meant that he had to bring a substantial amount of personal backing to earn the opportunity to display his talents on such a stage. “I’m lucky to have excellent sponsors who have helped me to make it all happen. Without their backing there is no way I could have made the jump to the GT class.” From Eversheds (Business lawyers), Microscan (IT hardware, Telecoms and Office Equipment Suppliers), Jebson Homes (House Builders) and Arai (crash helmets), Barff has attracted an impressive range of sponsors from a wide variety of businesses, a credit to this very modern racing driver. Now 28 years old, Rob’s racing career, like so many others, began on the kart tracks, in Barfff’s case back in 1987. Six years later, in 1993 he was Champion of Oulton Park in Formula Ford, a success that led to a works Swift drive the following season (albeit a season cut short when his main sponsor went bust). It was at this point that Rob started to earn money full time from Motorsport as an instructor, before re-entering the fray in 1998 with a short programme of Caterham races. 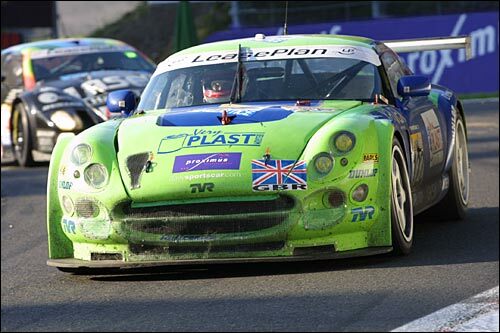 The sportscar bug clearly bit hard and 1999 saw a full season in the Caterham Roadsports championship – a season which very nearly ended with a championship title, Rob eventually finishing runner-up to Rob Jenkins on countback when the drivers had to drop two scores. It had, however, inspired him to push onwards and upwards and, responding to an ad. in Autosport, he contacted Martin Short about an interesting looking project to introduce the TVR Cerbera Speed Six into the GTO class of the British GT Championship, with Short’s Rollcentre Racing team. Barff was immediately impressed with the car, the boss and the project. Shorty for his part was sufficiently impressed with Barff to do a ring-round of his Caterham opposition to find out what kind of racer and what kind of man he might be handing over his TVR to! He must have liked what he heard, because Barff was confirmed in the Cerbera alongside the boss for an attack on the 2000 British GT Championship. The car’s first outing at Croft was a mixture of highs and lows. The car qualified on the class pole straight out of the box, but a mechanical failure pitched Rob into the barriers midway through the race. The potential though, of both car and driver, was there for all to see. The team made steady progress throughout the season, culminating in an astonishing and emotional class win at the late-lamented Spa round of the championship. The result was particularly significant as it marked the first ever non-Porsche win in ‘GT3’ anywhere in the world (two weeks before the BMW M3’s first success). By now, the highly motivated team boss was working on the follow up. The soon to be familiar Tuscan R was built with lessons learnt from the Cerbera project, and carried the team to further race-winning success in 2001. The highlight for Barff though was a run in the Suzuka 1000kms in August. 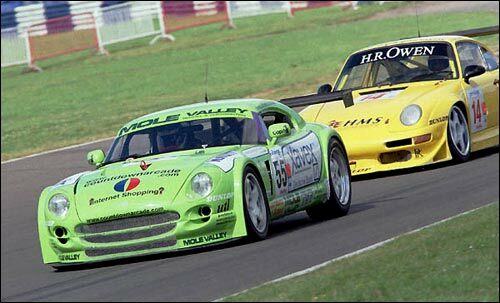 By this time Rob was already planning for a move up to the bigger GT class cars in 2002: his performances behind the wheel of the Rollcentre TVRs had served him well and his reputation as a safe and rapid driver had spread. A TVR factory drive for 2002 was a major career boost. It all comes down to budgets however and now, more than ever, they are at a premium. 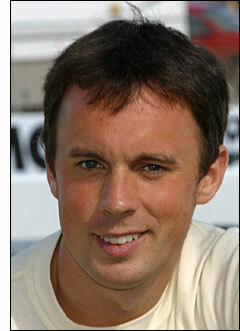 One major boost was the confirmation of Barff’s membership of the British Racing Drivers Club. “As a source of advice, support and contacts it’s invaluable, to say nothing of the honour of being a member.” That support both from his BRDC colleagues and his sponsors and family will indeed be invaluable. The life of a professional racing driver nowadays is a tough one. A typical weekday for Rob starts at 5am, with 6.30-8.30am taken up with training in the gym (Barff shares a trainer with Andy Priaulx) before starting the day job at 9am (Rob is now a full time race instructor at Silverstone). The end of the day job marks the start of his evening’s work in his office at home, as he continues the drive for backing for both this season and the future. 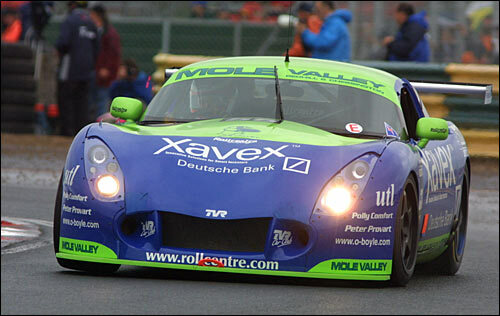 Rob returned to the scene of his Spa triumph for the Proximus 24 Hours in August 2002, racing not only with Martin Short but also with his replacement in the Rollcentre Racing squad – Simon Pullan - and with the very same Cerbera Speed 6 that Rob and Martin won at Spa with back in 2000. Rob Barff has his sights set on a long-term future in sportscars. He’s highly motivated: “I hate losing, I really really do!” He’s highly mature and professional: “I bring it home, I don’t crash!” And he’s a dream for his sponsors and the media.